Our Last First Time by Sue Brescia. 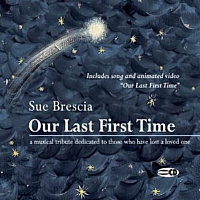 Sue Brescia, a New Age, Adult Contemporary singer, songwriter, and composing musician from Middletown, Rhode Island, recently released her second CD, Our Last First Time. By composing her original arrangements with simplicity, beauty and breadth, the 16 music compositions, title song and animated video are like a music symphony dedicated to the love shared between two people, even beyond the life experience of sorrow and loss. The contemporary instrumentals in Our Last First Time are appropriately named after each line of every verse from the title song to encompass the full spectrum of the CD, which articulately capture emotions ranging from lightheartedness to an introspective tranquility. It is through the masterful blending of piano, woodwinds and strings that the heartfelt quality of her arrangements are conveyed. Sue Brescia began her career as a singer in a top 40 band at age 18, while also performing in various cabarets and theaters in New England. After several years in Summer Stock Theater, a cabaret performance for the Royal Family, and an appearance at New York’s Catch A Rising Star, Sue Brescia began writing songs and produced her first CD release, Hope Rising in 2007. It was from this CD release that her song Forget You Never was listed among the International Top 40 according to the International Association of Independent Recording Artists. The song Passage of Time from her Hope Rising CD, was another achievement for her after having been selected from more than 350,000 artists worldwide to appear with Natalie Merchant, Carly Simon and Livingston Taylor in contributing to the Life in the Years, and More Life in the Years CDs, a compilation of music to benefit the Alzheimer’s Association. Our Last First Time comprises the collection of Sue’s life experiences and mortality’s reasoning which has sculpted her into the artist she is today. It is where her fervency for music originates. Writing lyrics to a song, composing an arrangement, all come from the core of her being, from a spiritual place. Sue’s album was also selected among the top entries and runner up status in the December 2010 round during the Song of the Year song and lyric competition. Visit suebrescia.com and find at her Amazon.com page. Visit Sue’s YouTube channel. Album art courtesy Sue Brescia.